I got the idea for this laptop birthday cake because my oldest son seems to have been born with a laptop computer in his crib. He has been fascinated with computers since he could hold his head up. So what would be better for his birthday than a laptop computer e-mail greeting. My kids only like my homemade cakes so no bakery cakes for us. I don't have fancy equipment or cake molds so we rely on creativity! I began with a simple sheet cake baked in a 9 x 13-inch pan. When it cooled, I covered the entire cake with chocolate fudge frosting. Next, I made some butter cream and tinted it computer screen blue and some yellow for contrast. We made the keyboard keys and screen buttons with miniature marshmallows - making sure that we maintained the integrity of the keyboard layout! The screen was put in place and a birthday message was added HB (Happy Birthday) :)(emoticon) WillyJL1 (my son's e-mail name). 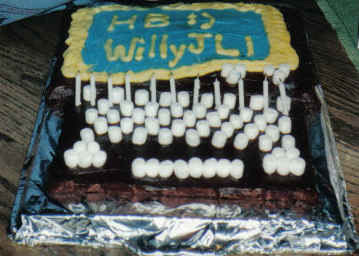 The cake was a hit and the kids even "practiced" typing on it before we served the cake. Another great idea that was easy and fun! Love it! Great idea and so simple. Thanks for putting it on the web. I LOVE IT! WHAT A CREATIVE CAKE! GREAT JOB!